Penguins are objectively adorable animals. The flappy little buddies waddle around on stubby feet, and some even like to be tickled. Their chicks are basically cute fluffballs made of fat and charisma that dance in children’s movies. However, a new fossil discovery in New Zealand has revealed an ancestral penguin species that was considerably more intimidating than today’s agreeable Antarctic chaps. This long-extinct penguin was immense—standing nearly six feet tall and weighing more than two hundred pounds—one of the largest semi-aquatic birds to ever shuffle across the Earth. Gigantism in penguins—where the size exceeds that of the four foot-tall emperor penguin (Aptenodytes foresteri), the largest living species—is not a paleontological revelation. Penguins are among the oldest groups of modern birds, and over their tens of millions of years of evolution, we now know there have been plenty of giant forms that have come and gone. Icadyptes and Inkayacu were human-sized penguins with sharp, heron-like beaks that patrolled the coast of Peru more than 30 million years ago. Pachydyptes—from New Zealand during the same time period—and Anthropornis (from New Zealand and Antarctica of 40 million years ago) were larger still. One Antarctic species, Palaeeudyptes klekowskii, could have been tall enough to peck Michael Jordan in the face. So, the new species—described in a paper published today in Nature Communications—joins a long, established list of titanic penguins. But this particular bird is unique. It’s extremely old, being not only the earliest known giant penguin, but also one of the first penguins, period. It also belongs to a totally different branch of the penguin family tree than basically every other giant penguin. By comparing features and dimensions of Kumimanu’s bones with other ancient penguin remains, the research team was able to get an idea of how closely related Kumimanu was to other species, along with an assessment of the extinct bird’s size. 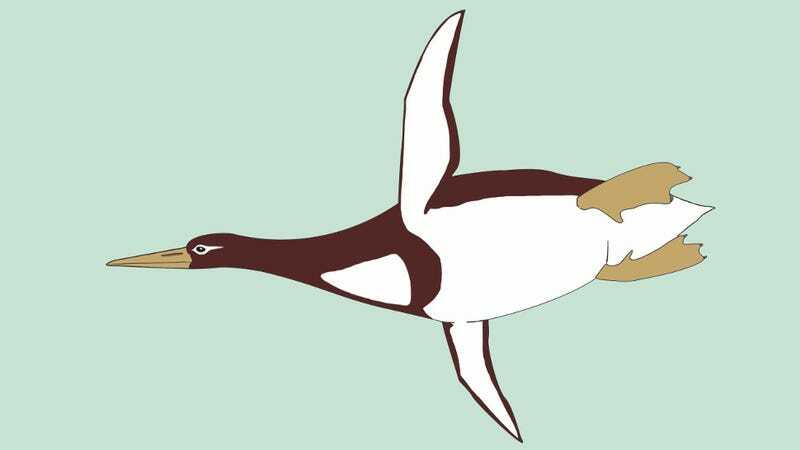 They found that Kumimanu had many bone features in the wings and shoulders that were between those of the later giants, and those of the only penguins older than Kumimanu (like Waimanu). Kumimanu appears to be a primitive offshoot of the penguin lineage, far outside the branch that most giant penguins belonged to—a now-extinct arm of a modern penguin family called Palaeeudyptinae that existed 15 to 20 million years after Kumimanu’s time. Some of Kumimanu’s bones are bigger than their counterparts in any other penguin. Based on this, the upper end of Kumimanu’s size range could make it the largest species of penguin ever. More conservative estimates still place it near the top, as tall or taller than a human male, and every bit as heavy. Kumimanu would have been an imposing sight in ancient New Zealand; a bird of dinosaurian proportions only a few million years after the mass extinction capping the Cretaceous. We now know, incredibly, that ancestral penguins survived the event that killed the big, non-bird dinos, and then rapidly blew up in size. It’s possible this rapid evolution and diversification in the southern oceans was in response to the sudden demise of large marine reptiles, which initiated something of an ecological hiring spree to fill the vacant roles, and penguins happily obliged. The giants died out by about 20 million years ago, perhaps due to competition with marine mammals like toothed whales, seals, and sea lions, which were all hitting their stride around then. Kumimanu shows that there’s still much to learn about the evolutionary history of the most endearing Antarctic residents, a group that outlasted a mass extinction and went through a 30+ million year gigantism phase—much longer than previously thought.